The sultan who saved the coconut stamp. Major-General Sultan Sir Ibrahim ibni Al-Marhum Sultan Sir Abu Bakar Al-Khalil (1873–1959) was an only son who ruled for 64 years. He commanded the unique state-level armed forces, the Royal Johore Military Force, and was the only Malay sultan to be portrayed in western military uniform. The uniform is similar to the No. 2 dress of the British Army, a departure from all previous Johore stamps, in which the sultan wore the more formal ceremonial No. 1 dress. The No. 2 almost gives the sultan an air of congeniality, befitting of the coconut definitive's rustic character as a "people's stamp". The sultan is rarely pictured wearing a beret as above; he usually wore a peaked cap. A younger Sultan Ibrahim in No. 1 dress. 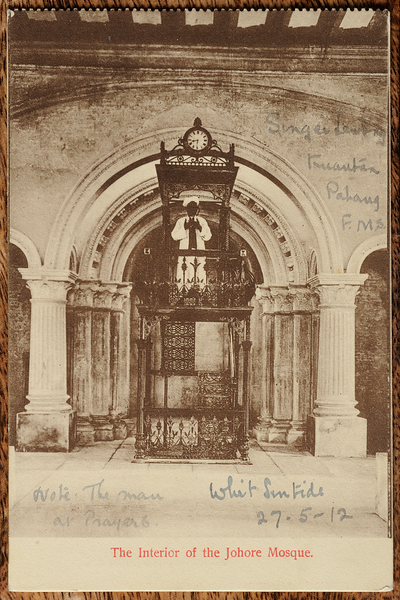 Like a scene from a science fiction movie, the imam meditates from the lofty pulpit or minbar in Johore's Sultan Abu Bakar Mosque (c. 1900). Designed by architect Tuan Haji Mohamed Arif bin Punak in the Victorian style, it was one of several buildings in Johore that accommodated the Anglophilic sentiments of Sultan Ibrahim, who spent his last years in London. A fascinating juxtaposition of islam and christianity is offered by way of reference to Whitsuntide 1912 alongside the scribbled 'Note: the Man at Prayers'. Postcard by G. R. Lambert & Co. Ltd.
During the Malayan Emergency, Johore experienced some of the worst violence, perhaps owing to the large population of rural Chinese and large swathes of swampy jungle. This led the sultan to say famously, "my state is at war" (Holley 2014). 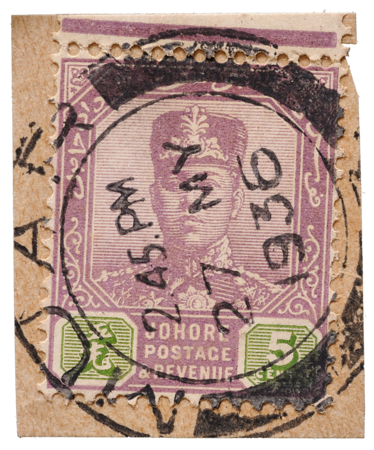 Postmarked in Singapore in 1959, the year Sultan Ibrahim died. The destinies of Johore and Singapore are intertwined; Singapore was the birthplace of the sultan, while the Sungei Johore watershed is providing the island with fresh water for a hundred years. 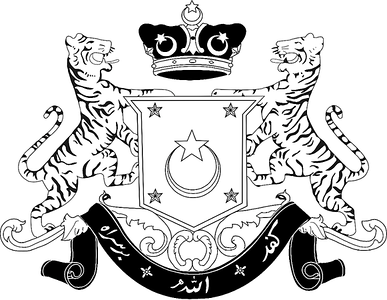 The coat of arms of Johore. To this day, Johore remains a maverick state with a outspoken sultan of the same name who, like the late Ibrahim, asserts the right of Johore to plot its own destiny. The fibre remnants in the perforations are probably a sign of worn-out pins in the perforating machine. 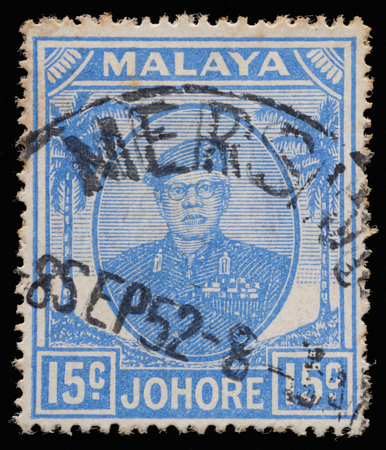 This stamp was postmarked in the town of Mersing on the east coast, which during World War II had been anticipated as a likely landing place for the Japanese invasion force (Bose 2012). 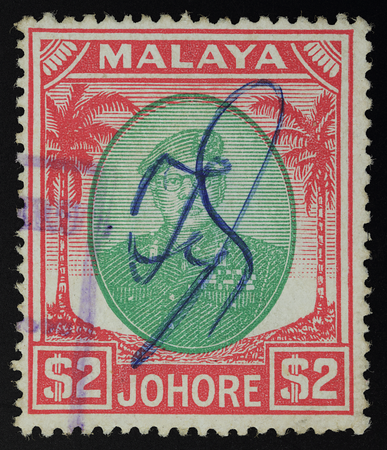 Johore is the only state whose name on the stamp was printed only in English and light-on-dark. The typeface of JOHORE follows that in the denomination tablets, giving the bottom panels a homogeneity of typographic style not found in the other state issues. It superficially resembles the bold condensed version of Monotype’s Grotesque Display, whose origins date from William Thorowgood’s Grotesque of 1832. But there are subtle differences, especially in the 'R', the 'E' and the slanted cut of the end of the hook of the 'J' on the stamp. 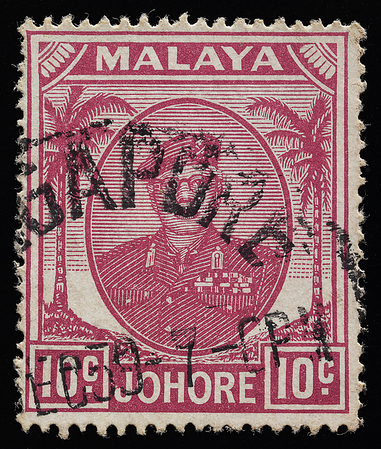 Sultan Ibrahim probably had some interest in stamp design; in 1957, he again rejected a new design (The Straits Times), prolonging the tenure of the Johore coconut definitives beyond those of the other states. 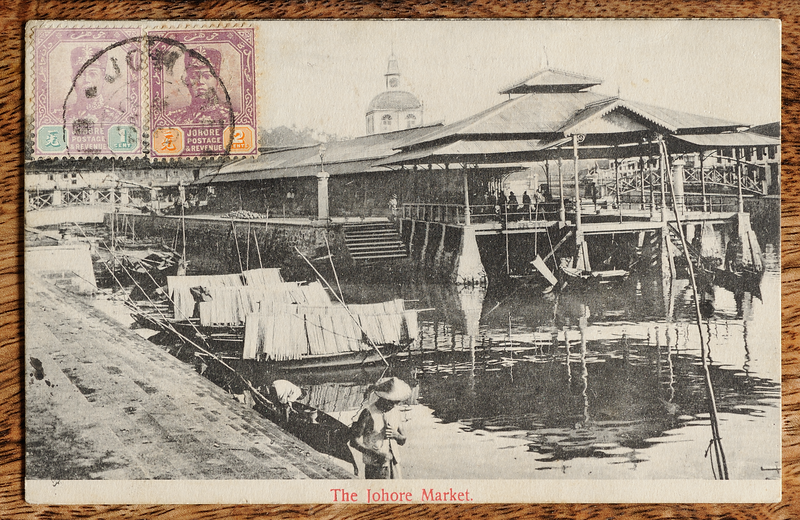 The Johore Market (built in 1894) on Sungei Segget, Johore Bahru's own romantic incarnation of the Thames in London or the Seine in Paris. The market sits on an island, evident from the bridge on either side. Sadly, Sungei Segget became one of the dirtiest rivers in the peninsula and was covered up in 2005 in an attempt to reduce the stench of sewage and rubbish. Published by G. R. Lambert & Co. Ltd.